The Indiana Glass Company was formally created in 1908, though the origin of the factory was some years earlier - in 1896 when it was used for building and repairing railroad carriages. 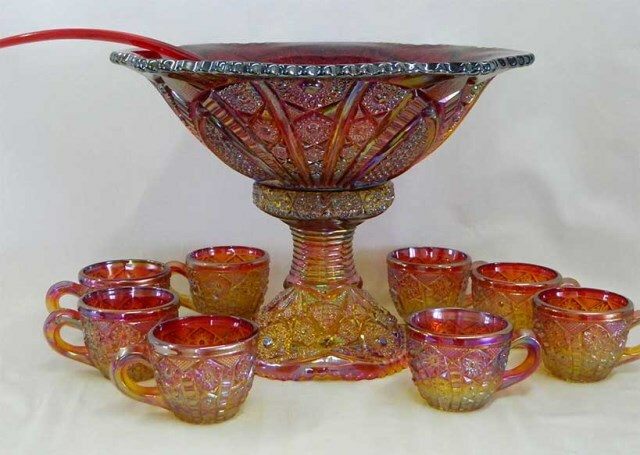 It was acquired by The Beaty and Brady Company which started to make domestic glassware, and later, in 1899, it became part of the National Glass Company combine. When this company failed, the plant was bought from receivership and became the Indiana Glass company. The area benefited from enormous local supplies of natural gas, although Indiana Glass also produced its own supply, made from coal. 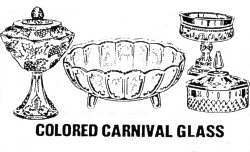 ​Indiana Glass did not make any Classic (old) Carnival Glass. 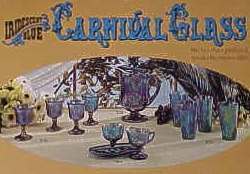 In fact whilst the major makers of Classic Carnival Glass such as Fenton, Northwood and Dugan were increasingly active in promoting their iridised ware at that time, Indiana was offering pressed crystal glassware in imitation cut glass patterns. On the right is a Butler Brothers wholesale ad from their Mid-Spring 1911 catalogue. It shows three items in crystal glass, in the Indiana pattern we now call Heirloom. During the Depression years Indiana produced a great deal of tableware and later, automobile lenses. In the late 1950s, Lancaster Glass purchased Indiana and in the early 1960s, the company became part of the large Lancaster Colony Corporation. ​In the 1970s Indiana became a major producer of Contemporary Carnival Glass (see below). ​In 2002, glassmaking at Indiana Glass, Dunkirk, ceased (although it seems the name continued as "Indiana Glass" with production elsewhere for a while). Above: a Butler Brothers ad in their Mid-Spring 1911 catalogue. It shows three pieces in crystal glass (the round bowl and the covered comport on the top row, and the pitcher). The pattern is what we now call Heirloom. 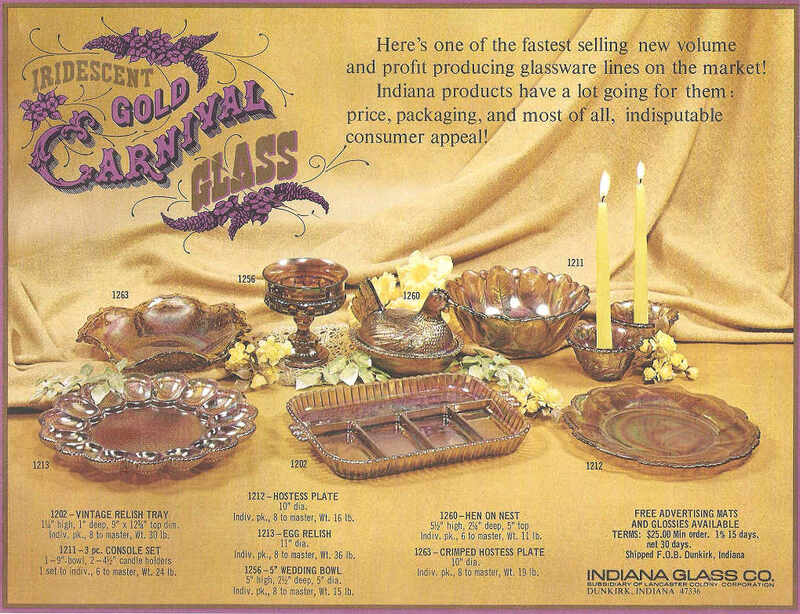 When Indiana started to make Contemporary Carnival Glass in the 1970s, they not only introduced new patterns and shapes, but they also turned to some of their old moulds that were in use in their early years. These old moulds were not used for Carnival Glass production originally, so although the items produced in Contemporary Carnival do not have any maker's mark, it is clear that the iridised items are of modern production. A good example is Heirloom - in it's early days, it was produced in crystal (non-iridised) glass, imitating cut glass items. Indiana called it their 123 Pattern. It was the 1970s reissue that Indiana called their Heirloom Series pattern. Left: an extract from the Butler Brothers Mid-Spring 1909 wholesale catalogue, showing the pattern Indiana originally called "123 Pattern". Above: the mould was revived in the 1970s to make this magnificent Heirloom pattern Contemporary Carnival punch set in Sunset Red Carnival. Picture courtesy of Seeck Auctions. ​Indiana became a major producer of Contemporary Carnival Glass during the 1970s, launching various ranges in distinctive colours, patterns and in shapes that are familiar to most collectors today. ​The first colour Indiana introduced was "Iridescent Blue" in 1971. This was followed by followed by "Iridescent Gold" (a golden yellow-amber shade), "Iridescent Sunset" (red to amberina), "Iridescent Green" and finally in 1974, "Iridescent Amethyst." ​Purple and rare black were also used by Indiana. 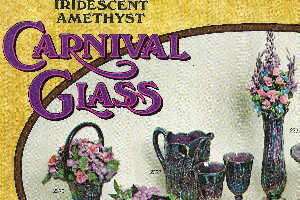 "Iridescent Gold Carnival Glass" - with indisputable consumer appeal! ​#1212 Hostess Plate; #1213 Egg Relish; #1256 5" Wedding Bowl (aka Kings Crown); #1260 Hen On Nest; #1263 Crimped Hostess Plate. "Iridescent Blue" Carnival Glass - spectacular volume sales! #2892 Garland Bowl; #2893 5 inch Wedding Bowl (aka Kings Crown); #2908 Hostess Plate, ruffled. 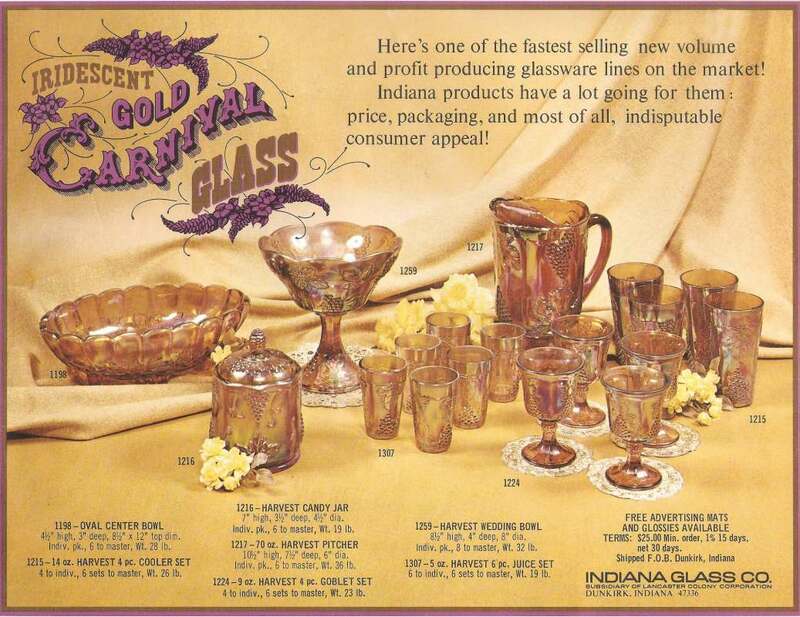 ​A report from California, written for Carnival Glass Encore in 1984 noted that Indiana Carnival Glass first appeared in local Safeway stores in 1970: "at that time it was really cheap, all the major drugstores had a big line." The K-Mart ad on the left below is typical of how their glass was being promoted and sold through various major outlets. Later, in the 1980s it was being sold in Thriftway grocery stores in colourful Indiana boxes. A Whitehall pattern covered candy, as sold in its original box. Indiana also made glass for Tiara Co. in 1971. Tiara was an independent sales and merchandising company based in Dunkirk, Indiana, and they used the House Party Plan for selling. 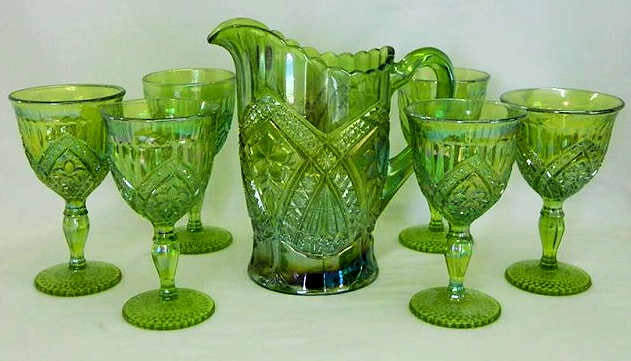 ​Quite scarce examples of light green Carnival "Eclipse" (a geometric pattern often simply called "Tiara") water set which comprised a pitcher and four stemmed goblets were made in the early 1970s by Indiana for them (shown, right). 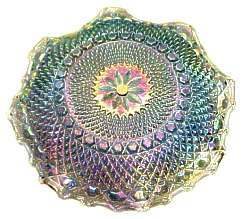 This was actually made using an old Indiana Glass mould known originally as "Eclipse"(as well as "Flower Medallion" by Pattern Glass collectors). Other Tiara items included a Diamond Point covered candy box, compote and chalice in marigold as well as a swan flower arranger. More Carnival for Tiara was made in black in the shape of a covered compote, tall tumbler and cookie jar in a sawtooth pattern called Cameo; these items were only sold through their House Party Plan. A Tiara pattern water set in light green Contemporary Carnival. 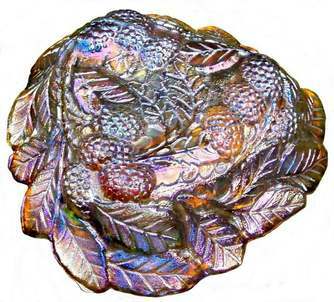 Indiana produced a wide range of Carnival shapes and patterns which, although no trademark is present, can usually be distinguished by the company's distinctive colours and iridescence. ​Probably the most readily found are their Harvest (aka Harvest Grape) and Heirloom patterns (see the links in the "Read more..." section below). Covered Hens were also immensely popular, as were the delightful Egg Hors D'oeuvre Dish and the Egg Relish, and even a "copy" of Sowerby's Chunky (aka #2266, aka English Hob and Button) which Indiana called their Hostess plate. ​Indiana originally made these dishes circa 1920s-1930s in green and pink (non-iridised) glass; they were listed as No. 606 “Loganberry” bon bon and No. 605 7 inch Nappy in the “Lily Pons” range. The moulds were re-used in the 1970s for Indiana's Contemporary Carnival production. ​​Loganberry (aka Strawberry Relish) bon bon. ​The amber-like colour was called “Gold” or “Goldentone”. A 1974 ad - free Indiana Carnival for Christmas! 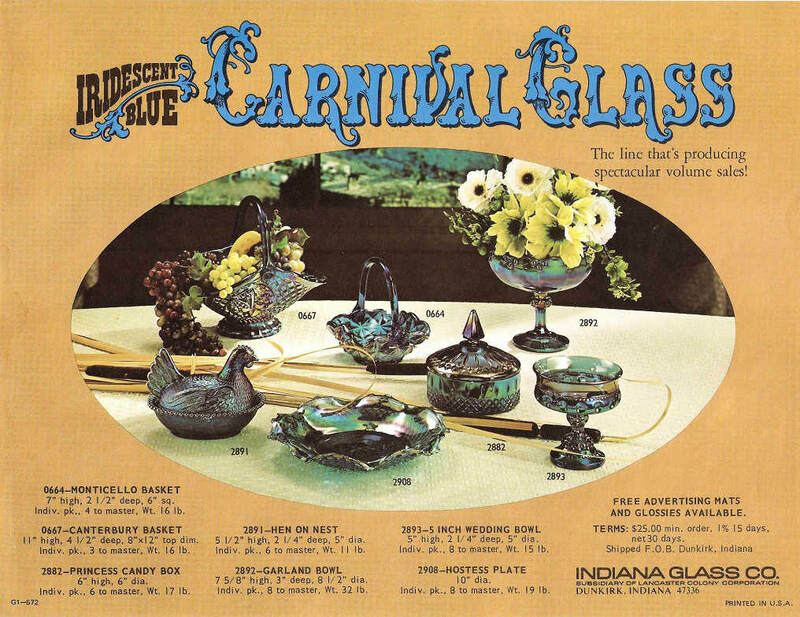 Read more about Indiana's Contemporary Carnival Glass - click on the images below.